Everyone likes radiant floor heating because everyone likes warm feet. But the real issue in cottage country is how to make it happen practically. Hydronic systems that pump heated liquid through pipes in the floor are great, and I’ve installed the Warmrite system in one of my own buildings. That said, there are a couple of unique issues to consider in the case of a cottage. If your floor plan is small, then you might find the fixed costs of a hydronic control panel too high given the amount of heat required and the time you’ll be using the building. Also, there’s the added trouble of draining water from the system when you’ll be away during cold weather. Although antifreeze runs through the pipes in the floor, you’ll still have to drain water from the boiler or hot water heater if you don’t want to leave it running. Another option is in-floor electric heating. Think of it like an electric blanket installed underneath your finished floor. Nuheat is one Canadian supplier that I’ve had good experiences with. 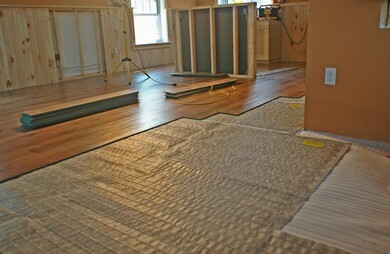 You roll out the heating mats, and then install laminate, ceramics or most any other kind of flooring on top. Electricity is a more expensive source of heat than fossil fuels, but if your building is small and well insulated, it may not matter much. Radiant electric heat requires no seasonal draining and is simple enough for do-it-yourself installation. Either way, be sure to insulate the bottom side of your concrete floor slab. Two inches of rigid polystyrene foam applied to the soil before pouring concrete works well.